While I was in Houston for a week visiting family, I decided that it would be a good time to bake my Bundt for April’s BundtaMonth because 1. Time would be short when I got back to Dubai and 2. I had been invited over for dinner and 3. I found this lovely Bundt pan in my cupboard. Our BundtaMonth hosts, Lora and Anuradha decided that our theme this month is cherries! Since they are frankly hard to find fresh at this time of the year in Houston, I decided to go with dried cherries and add in some fresh blueberries to join them. 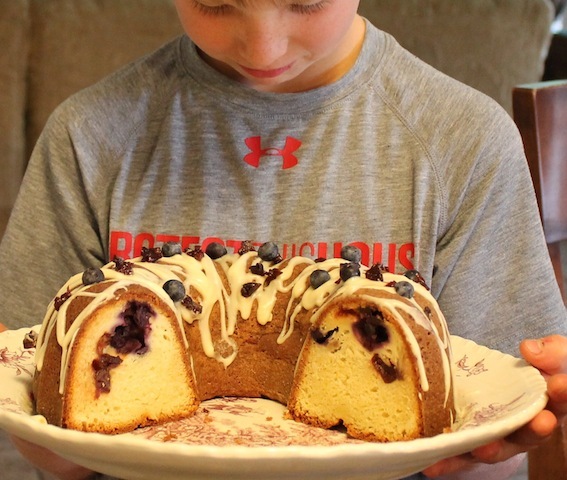 This Bundt has three layers: Cream cheese pound cake batter, followed by a cream cheese filling based on the cream cheese layer in this great recipe from fellow BundtaMonth member, Anita from Hungry Couple, and then another layer of the pound cake batter. Then, to top it all off, a drizzled cream cheese glaze. I took it over to my little sister’s house for dinner and her youngest son fawned over it lovingly until it was time for supper. Then they all had healthy (not healthy!) slices for dessert. I tell you true: Like baking pans, there is no such thing as too much cream cheese. who was sick with bronchitis and needed love and sugar. Preheat your oven to 350°F or 180°C and prepare your Bundt pan by spraying liberally with non-stick spray and then coating with a little flour. The filling is very easy. Add all the ingredients, except the cherries and blueberries, to your mixing bowl and beat until smooth and lump free. Fold in your cherries and blueberries. Cover with cling film and refrigerate until needed. For the cake batter, in a large bowl, mix together the flour, baking powder, baking soda, and salt and set aside. In the bowl of your electric mixer, or with a hand mixer, beat the butter and cream cheese until smooth. Add the sugar, either a third at a time, beating well after each addition, or in a slow continuous stream as you are beating. Continue beating on medium-high speed until light and fluffy (about 3 - 5 minutes). Add the eggs, one at a time, mixing well after each addition. Add the vanilla and lemon zest and beat until incorporated. Add in half the flour mixture and beat again. Add the rest of the flour mixture and beat just until incorporated. Pour half the batter into the prepared pan and smooth the top. Spoon on the cherry blueberry cream cheese filling and spread it around the pan. Top with the remaining cream cheese batter. Bake for about 55-65 minutes in your preheated oven or until a toothpick inserted comes out clean. Allow the cake to cool in the pan for at least 15- 20 minutes before trying to remove it. It should start to pull away from the sides of the pan as it cools. To remove it, place a wire rack upside down on the cake and invert the cake pan to release the cake. Allow to cool completely before adding the glaze. While your cake is cooling, chop your extra decoration cherries and set aside. In a small bowl, combine your first three glaze ingredients and then add the milk, starting with just 1 teaspoon. Continue mixing well and adding milk one teaspoon at a time until you reach drizzling thickness. I ended up adding only 3 teaspoons to mine. When your cake is completely cool, add the cream cheese glaze to a small baggie and cut the corner off. Squeeze out the glaze slowly and drizzle it all over the cake. Stud it with bits of cherry and whole blueberries to decorate. - Post it before April 30, 2013. Throwing in some fresh berries completely changes the cake. So wonderful Stacy! I´m finding so many pans that I thought I´d lost or didn´t have, and you´re right, there can never be too many. Same for cream cheese frosting! That's what I though, Paula! If I had had fresh cherries, I might still have put them both but with the dried cherries, I felt fresh SOMEthing was needed. Can't wait to see the pans you have rediscovered! Oh, yum, yum and more yum! I'm so glad you liked my cream cheese layer. :) Cream cheese is yummy! Your photos are beautiful and I'm loving the icing on this. Thanks, Anita! When I heard the theme was cherries, I knew I had to make something cheesecakey. Who knows why these things have to happen? One day I am going to make your whole crumb cake too. Yeah, sadly it got left behind in Houston again, Anne. This only one-free-bag thing is really cramping my packing style. I'll try to bring it back to Dubai when I am home again in June. Thanks for your kind words. There you go combining cherries with my favorite berry. What a winning combo! A simply gorgeous pan too. Oh, and one cannot have too many baking pans. Thank you, Renee! I knew I would get support from this group on my pan addiction. :) I've never made anything with dried cherries before but they added a lovely tartness with the blueberries and cream cheese. That is just stunning! So, ya think I should enter my electric neon bundt cake with the Peeps?!?! Well, you know this is going straight to my Bundt-O-Rama board for me to try soon. In fact, it already has. 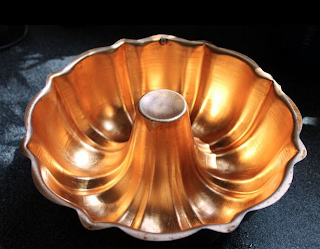 BTW - you forgot you had a beautiful bundt pan? You have too many pans or houses or something! :) Once again - this is one of your best bundt cakes! That's it, Kelli! I don't have too many pans, just too many houses! Which is totally not my fault. Your peep-colored cake was fabulous! It doesn't have cherries so you can't add it to the linky tool but you should join us in BundtaMonth for May! Stacy, your bundt looks fabulous. I love the addition of blueberries. It gives it an additional pop of color, not to mention blueberries are delicious and full of antioxidents. I sure could go for a slice of this for breakfast right now! Yum! Your bundt cake sounds wonderful with the combination of dried cherries which are tart and sweet blue berries...great idea. Thanks, Karen! That is exactly why I combined them! Thank you, Lora! It has been my utmost pleasure to be part of this group! Torn between what I like better--the pan or the cake! And yes you are spot on about the pan! Pinning to make with blueberries only. Yum! Totally drooling on that bundt. It looks fantastic!! Love the combination of blueberries and cherries-two of my favorites! Blueberries only would be wonderful too, Laura! Mine too, Heather! I can't wait for summer to try it with fresh cherries instead. Your cake looks amazing! It definitely makes me feel like I need to buy a bundt tin! If you choose your Bundt pan right, it will fit nicely almost inside another one, nestled together and not at all obvious to the untrained eye. Not that I am encouraging you to LIE to your husband, Nancy. No, not at all. :) Thanks for your kind words about the cake. It was super moist and delicious!